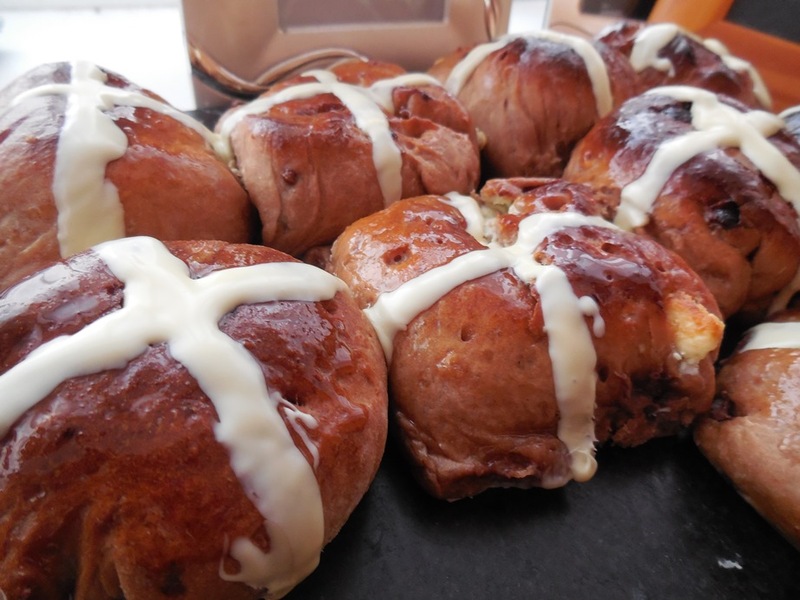 I always like to make an effort to bake something traditional and seasonal to mark special times of year and so last Easter, I decided to try my hand at Hot Cross Buns. Only trouble is, my husband and I both can’t stand dried fruit, so as usual I opted for chocolate instead! My first attempt was using a gluten-free recipe, which we both loved, but didn’t keep fresh for very long. This year, I opted instead for the ‘gluten-full’ version as I was keen to try my skills at kneading dough. We loved this too! 50 grams of butter plus extra butter for greasing. Add the flour, salt, cocoa and cinnamon into a large bowl. Rub in the butter to the flour mixture. Make a well and add in the honey, sugar and yeast. Beat the egg and add into the mixture. Heat the milk in a microwave for about a minute (until it is slightly warmer than room temperature) Add the milk into the mixture and mix together to form a dough. On a lightly floured surface, turn out the dough and flatten as much as you can. Add half the white chocolate and milk chocolate and work into the dough. Flatten the dough out again and work the rest of the chocolate into the dough. Knead the dough for approximately 5 minutes until it is smooth and elastic. Shape the dough into a ball shape. Grease the large bowl with butter and add the dough into the ball. Cover with a clean tea towel and place the bowl in a warm place for an hour to prove. After an hour, place the dough on a lightly floured surface and knock back ((??)) the dough. Shape it into a ball and place back into the bowl, cover with the tea towel and leave to rise for a further 30 minutes. After 30 minutes, turn the dough out onto a lightly floured surface, divide the mixture in two, roll out each of the two parts and divide each part into 6 equal pieces. Roll each piece into a ball and then flatten slightly to make a bun shape. Cover the 12 buns and leave to rest for 5 minutes. Grease a baking tray with butter (I greased two smaller baking trays as my oven isn’t that big) and add the buns to the tray(s). Place the buns in the oven for 10 minutes. While the buns are baking, place the golden syrup into a bowl and stir. Heat the golden syrup up in the microwave for 10-15 seconds. As soon as the buns are ready, brush the golden syrup over the buns, then place them on a wire rack to cool. After they have cooled, melt the white chocolate. To melt, I chop up the chocolate, place it into a microwaveable bowl and heat for 20 seconds at a time until just melted. In between each 20 second interval, I stir the chocolate making sure the mixture does not get too hot. Once melted, add to a piping bag and pipe a cross on each bun. Leave the chocolate to set and serve! The buns taste good straight from the oven. But please remember to cool slightly before eating- ‘hot’ should not be taken too literally! If you do not like cinnamon then feel free to leave this out. Use dark chocolate, if you prefer it to milk. The chocolatier the better! The buns taste good with butter spread over them. The only difficult part to this recipe is the kneading of the dough as it is quite stiff. ………….No jokes please about buns in the oven! !